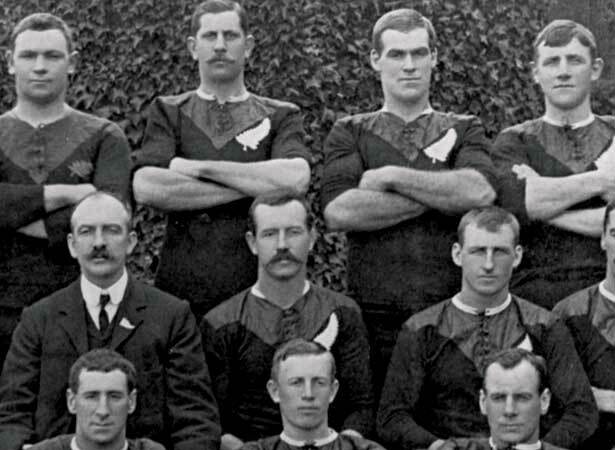 A great rugby rivalry was born when a try by All Black Bob Deans was disallowed, resulting in the only loss of the ‘Originals’ tour (see 16 September). The incident is still debated. The only score in the match played before a crowd of 47,000 at Cardiff Arms Park was a try scored by Welsh wing Teddy Morgan 10 minutes before halftime. As the All Blacks counter-attacked in the second half, Deans was sure he grounded the ball over the line before Welsh defenders dragged him back into the field of play. Portly Scottish referee John Dallas, 30 m behind the play, disagreed and awarded Wales a five-yard scrum. New Zealand captain Dave Gallaher accepted defeat in what he described as a ‘rattling good game, played out to the bitter end – the best team won’. Wales won three of its first four matches against the All Blacks, the last in 1953. The All Blacks have won all 25 subsequent tests. Their narrowest winning margin has been a single point, in matches played in Cardiff in 1978 and 2004. We have 13 biographies, 6 articles, related to All Blacks' non-try hands Wales historic win.